Dr. Elsa Vasseur is the Chairholder of the NSERC/Novalait/Dairy Farmers of Canada/Valacta Industrial Research Chair in Sustainable Life of Dairy Cattle. She received both her BSc and her first MSc in Rural Development from the Institut Supérieur d'Agriculture (ISA) in Lille, France as well as a second MSc in Animal Behaviour from AgroParisTech in 2005. She then came to Canada where she obtained her PhD in Animal Science from Université Laval in 2009, looking at on-farm assessment tools for the welfare of young dairy animals. After an NSERC Postdoctoral Research Fellowship, where she worked with some of Canada’s leading researchers in dairy-cattle welfare at the University of British Columbia and Agriculture and Agri-food Canada, she took up a research position at the University of Guelph’s Organic Dairy Research Centre on the Alfred Campus, before joining McGill in January 2016 as an Assistant Professor and Industrial Research Chairholder. 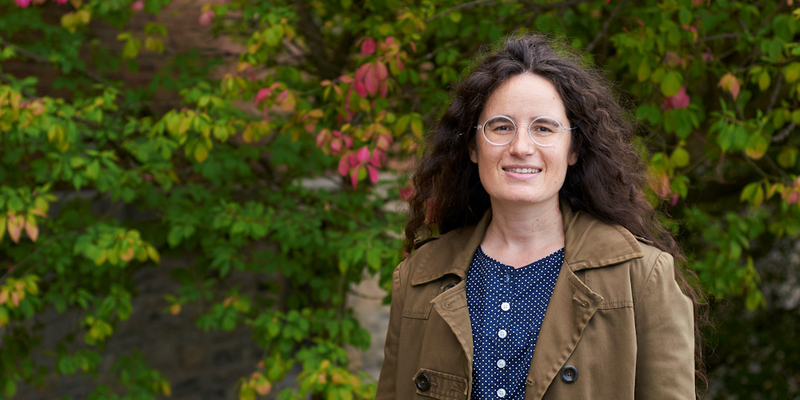 In her first 2 years at McGill, Professor Vasseur has been involved in the direction of 36 McGill-based HQP, co-authored 21 peer-review publications and 33 presentations at scientific meetings. Vasseur’s team is present a lot on social media through their blog http://cowlifemcgill.blogspot.ca/p/current-team.html (over 39,000 visitors) and twitter account (@CowLifeMcGill). Vasseur’s team participated to numerous outreach activities and published in extension papers, and many authors published about Vasseur’s research program (total of 28 extension and media pieces or events). Vasseur’s academic background is multidisciplinary and areas of expertise are plural i) applied animal behaviour science (ethology) for a better understanding of animal needs, ii) the development of outcome measures of welfare for animals in confinement and the links in between those outcomes and the risk factors in housing and management, and iii) study of knowledge and technology transfer methods to encourage adoption of new practices by farmers. Her international interests and experience include a CIDA project in the DR Congo looking at reducing poverty through renewable charcoal-based agroforestry systems; and a most recent mission by Food and Agriculture Organization of the United Nations (FAO) to develop a framework for the cooperation on livestock between Québec Gv’t and FAO in West Africa (Dakar, Sénégal November 2017). The first research theme will focus on producers’ needs to provide a suitable environment for future compliance requirements; another goal is to better understand the needs for animal comfort. As current research on comfort is mostly with free stall systems, it is relevant, to optimize recommendations, to carry out projects with tie-stall systems which are predominant in Quebec and in Canadian dairies. An example of research question is: Could some farming practices compensate for deficient stall configuration? The second research theme will focus on the sustainability of the industry in terms of long - term measures of profitability and survival of animals in the herds. Replacement animals and cows in production will be under scrutiny. Projects of this theme will benefit from data collected on the commercial farms and Valacta database. An example of research question is: What is the relationship between rearing and cow cow longevity? The third research theme will broaden the perspective on international standards, life cycle analyses, and consumer acceptability. We will validate that the measures to improve cow welfare and longevity are not in contradiction with the overall sustainability (environmental, economic and social) of dairy farming. An example of research question is: Could improving comfort may conflict with improving the environmental footprint? Animal Science: Understanding the roles in which animals are used by Society, especially in food production, companionship, research, and recreation; application of the scientific approaches that are used in assessing and improving animal welfare; and use of ethical approaches that are invoked in the use of animals, often in controversial contexts. An interdisciplinary course, based on active participation and discussion-method learning. Biology (Agric & Envir Sc): Management, preservation, and utilization of forage crops in sustainable tropical environments; examination of their value as livestock feed in terms of nutritional composition and impact on animal performance; land use issues as it pertains to forage and animal production in insular environments. 1. Vasseur E*. (2017). Invited Symposium Paper: Optimizing outcome measures of welfare in dairy cattle assessment.Journal of Animal Science. 95: 1365-1371. 2. Palacio S*, Lensink J, and Vasseur E. (in review). Two common knowledge and technology transfer methods and their strengths and limitation sin encouraging change to improve animal welfare: a review. Animal Welfare.No. G2133. 3. Shepley E*, Berthelot M, and Vasseur E. (2017). Technical Note: Monitoring behavior in dairy cows housed in tie-stall: validation of the ability of a 3D pedometer to accurately determine step activity.Agriculture.7: 53. 4. Palacio S*, Peignier L, Pachoud C, Nash C, Adam S, Bergeron R, Pellerin D, de Passillé A M, Rushen J, Haley D, DeVries T, and Vasseur E. (2017). Technical Note: Assessing lameness in tie-stalls using live stall lameness scoring. Journal of Dairy Science. 100: 5677-6582. 5. Higginson Cutler J, Rushen J, de Passillé A M, Gibbons J, Orsel K, Pajor E, Solano L, Pellerin D, Haley D, and Vasseur E*. (2017). Producer estimates of prevalence and perceived importance of lameness in dairy herds with tie-stalls, free-stalls and automated milking systems.Journal of Dairy Science. DOI: http://dx.doi.org/10.3168/jds.2017-13008. 6. Shepley E, Bergeron R, Bécotte F, and Vasseur E*. (2017). Short Communication: Dairy cow preference for outdoor exercise during winter under Eastern Canada climatic conditions.Canadian Journal of Animal Science. 97: 1-5. 7. Wormsbecher L, Bergeron R, Haley D, de Passillé A M, Rushen R, and Vasseur E*. (2017). A method of outdoor housing dairy calves in pairs using individual calf hutches.Journal of Dairy Science.100:7493-7506. 8. Shepley E, Bergeron R, and Vasseur E*. (2017). Invited Paper: Daytime access to pasture vs. free-stall barn in dairy cows with year- long outdoor experience: A case study. Applied Animal Behaviour Science. 192:10-14. 9. Franco-Gendron N, Bergeron R, Curilla W, DeVries T, Conte S, and Vasseur E*. (2016). Investigation of dairy cattle ease of movement on new methyl methacrylate resin aggregate floorings.Journal of Dairy Science. 99: 8231-40. 11. Ouellet V, Vasseur E, Heuwieser W, Burfeind O, Maldague X, and Charbonneau E*. (2016). Evaluation of calving indicators measured by automated devices to predict the onset of calving in Holstein dairy cows. Journal of Dairy Science. 99: 1539-48. 12. Charlton G L, Bouffard V, Gibbons J, Vasseur E, Haley D B, Pellerin D, Rushen J, and de Passillé A M.* (2016). Invited paper: Can automated measures of lying time help assess lameness and leg lesions on tiestall dairy farms?. Applied Animal Behaviour Science. 175: 14-22. 13. Nash C, Kelton D, Vasseur E, DeVries T, Parent D, Pellerin D, Carrier K, Pajor E, Rushen J, de Passillé A M, Coe J, and Haley D*. (in review). A survey of practices implemented to improve cow comfort on Canadian dairy farms, following a cow comfort assessment.Journal of Dairy Science. #JDS-16-12317.R1. 15. Villettaz Robichaud M, Rushen J, de Passillé A M, Vasseur E, Haley D, and Pellerin D*. (in press). Is the profitability of Canadian tiestall farms associated with their performance on an animal welfare assessment?. Journal of Dairy Science. #JDS-17-13316.R1. 16. Bouffard V, de Passillé A M, Rushen J, Vasseur E, Nash C, Haley D, and Pellerin D*. (2017). Impact of following recommendations for tie stall configuration on neck and leg lesions, lameness, cleanliness and lying time in dairy cows. Journal of Dairy Science. 100: 2935-2943. 17. Solano L, Barkema H, Pajor E, Mason S, LeBlanc S, Zaffino Heyerhoff J, Nash C, Haley D, Pellerin D, Rushen J, de Passillé A M, Vasseur E, and Orsel K*. (2016). Associations between lying time behavior and lameness in Canadian Holstein-Friesian cows in freestall barns.Journal of Dairy Science. 99: 2086-101. 18. Westin R, Vaughan A, de Passillé A M, DeVries T J, Pajor E A, Pellerin D, Siegford J M, Vasseur E, and Rushen J*. (2016). Lying times of lactating cows on dairy farms with automatic milking systems and the relation to lameness, leg lesions and body condition score.Journal of Dairy Science. 99: 551-561. 19. Nash C, Kelton D, DeVries T, Vasseur E, Coe J, Heyerhoff Zaffino J C, Bouffard V, Pellerin D, Rushen J, de Passillé A M, and Haley D*. (2016). Prevalence of and risk factors for hock and knee injuries on dairy cows in tiestall housing in Canada. Journal of Dairy Science. 99: 6494-6506. 20. Westin R, Vaughan A, de Passillé A M, DeVries T J, Pajor E A, Pellerin D, Siegford J M, Witaifi A, Vasseur E, and Rushen J*. (2016). Cow and farm-level risk factors for lameness on dairy farms with automated milking systems. Journal of Dairy Science. 99: 3732-3743. 21. Villettaz Robichaud M, de Passillé A M, Pearl D L, LeBlanc S J, Godden S M, Pellerin D, Vasseur E, Rushen J, and Haley D B. * (2016). Calving management practices on Canadian dairy farms: Prevalence of practices. Journal of Dairy Science. 99: 2391-2404. 1. Vasseur co-organized with artic ethologist Elliott, Natural Ressource Sciences, McGill, a scientific colloquium within the 85th annual scientific conference of Acfas (Association francophone pour le savoir) hosted by McGill, downtown campus, May 8-12, 2017. Scientific colloquium was named: 204 - Le suivi automatique du comportement animal : l’éthologie dans l’ère du « big data » (Transl. Automatic monitoring of animal behavior: ethology in the era of "big data"), and hosted on May 12, 2017. 2. Vasseur was a member of a discussion panel at the scientific colloquium 204 - Le suivi automatique du comportement animal : l’éthologie dans l’ère du « big data » (Transl. Automatic monitoring of animal behavior: ethology in the era of "big data"), on May 12, 2017, as part of the 85th annual scientific conference of Acfas (Association francophone pour le savoir) hosted by McGill, downtown campus, May 8-12, 2017. 3. Vasseur was Chair for the session ‘Sustainability and Animal Welfare’ at the 7th International Conference on the Assessment of Animal Welfare at Farm and Group Level hosted by Wageningen University and Research, September 5-8, 2017, Ede, The Netherlands. 4. Vasseur was Chair for the session ‘Animal Behaviour and Well-Being’ at the 2016 ADSA-ASAS-CSAS Joint Annual Meeting. July 19–23, 2016, Salt Lake City, UT, USA. 5. Vasseur E*. 2017. New research initiative on the comfort, longevity and sustainable life of dairy cattle. Invited presentation at Annual Scientific Meeting of the Canadian Bovine Mastitis and Milk Quality Research Network (CBMQRN), May 8, 2017. Montreal, QC. 8. Palacio S, Adam S, Bergeron R, Pellerin D, de Passillé A M, Rushen J, Haley D, DeVries T, and Vasseur E*. 2017. A sustainable management option for tie-stall farms: providing year-long exercise helps improve dairy cow welfare. 7th International Conference on the Assessment of Animal Welfare at Farm and Group Level hosted by Wageningen University and Research, September 5-8, 2017, Ede, The Netherlands. 9. St John J*, Rushen J, and Vasseur E. 2017. What is the effect of new tie-rail height and forward positions based on the cow neck line on ruminating and feeding behaviors of dairy cows housed in tie-stalls? 51st Congress of the International Society for Applied Ethology August 7-10, 2017, Aarhus, Danemark. 10. Shepley E*, Berthelot M, and Vasseur E. 2017. Validation of the ability of a 3D pedometer to accurately determine number of steps in dairy cows when housed in tie-stall. 51st Congress of the International Society for Applied Ethology August 7-10, 2017, Aarhus, Danemark. 11. St John J*, and Vasseur E. 2017. Analyse de photos pour détecter l’apparition et suivre l’évolution du niveau de blessures corporelles chez la vache laitière (Transl. Photo analysis to detect the occurrence and follow the evolution of the level of body injury in the dairy cow). Scientific colloquium 204 - Le suivi automatique du comportement animal : l’éthologie dans l’ère du « big data » (Transl. Automatic monitoring of animal behavior: ethology in the era of "big data"), on May 12, 2017, as part of the 85th annual scientific conference of Acfas (Association francophone pour le savoir) hosted by McGill, downtown campus, May 8-12, 2017. 12. Fadul-Pacheco L*, and Vasseur E. 2017. Récupération et analyse de données massives en provenance des systèmes de traite informatisés (STI) pour le développement d’indicateurs de performance et de bien-être chez la vache laitière (Transl. Recovery and analysis of mass data from computerized milking systems (ITS) for the development of performance and welfare indicators in dairy cows). Scientific colloquium 204 - Le suivi automatique du comportement animal : l’éthologie dans l’ère du « big data » (Transl. Automatic monitoring of animal behavior: ethology in the era of "big data"), on May 12, 2017, as part of the 85th annual scientific conference of Acfas (Association francophone pour le savoir) hosted by McGill, downtown campus, May 8-12, 2017. 13. Stecko P*, and Vasseur E. 2017. Suivre l’utilisation que la vache laitière fait de son espace à la stalle à l’aide de technologies de biotracking (Transl. Follow the use that the dairy cow makes of her space at the stall using biotracking technologies). Scientific colloquium 204 - Le suivi automatique du comportement animal : l’éthologie dans l’ère du « big data » (Transl. Automatic monitoring of animal behavior: ethology in the era of "big data"), on May 12, 2017, as part of the 85th annual scientific conference of Acfas (Association francophone pour le savoir) hosted by McGill, downtown campus, May 8-12, 2017. 14.Boyer V*, and Vasseur E. 2017. Utilisation de collecteurs d’activité pour mesurer les comportements alimentaire et de rumination chez les vaches laitières (Transl. Use of activity loggers to measure feeding and ruminating behavior in dairy cows). Scientific colloquium 204 - Le suivi automatique du comportement animal : l’éthologie dans l’ère du « big data » (Transl. Automatic monitoring of animal behavior: ethology in the era of "big data"), on May 12, 2017, as part of the 85th annual scientific conference of Acfas (Association francophone pour le savoir) hosted by McGill, downtown campus, May 8-12, 2017, Montreal, QC. 16. Palacio S*, Adam S, Bergeron R, Pellerin D, de Passillé A M, Rushen J, Haley D B, DeVries T J, Vasseur E. 2017. The effects of access to pasture, winter exercise, and modified stalls on the welfare and behaviours of dairy cows kept in tie-stalls. 13th ISAE North-American Regional Meeting. May 12-13, 2017, Iowa State University, Ames, IA, USA. 17. Vasseur E*, Rushen R, de Passillé A M, and Pellerin D. 2016. How to make sure cows age well: incorporating economics, environment and welfare for truly sustainable animal farming. 50th Congress of the International Society for Applied Ethology July 12-15, 2016, Edinburgh, UK. 19. Palacio S*, Adam S, Bergeron R, Pellerin D, de Passillé A M, Rushen J, Haley D B, DeVries T J, and Vasseur E. 2016. Effect of stall improvement and regular exercise on body injuries of cows housed in tie-stall. 50th Congress of the International Society for Applied Ethology July 12-15, 2016, Edinburgh, UK. p248. 24. Brunette (Wolfe) T, Vasseur E, Devries T and Bergeron R*. 2016. Effects of alternative deep bedding options on dairy cow preference, lying behaviour, injuries and hygiene. 50th Congress of the International Society for Applied Ethology July 12-15, 2016, Edinburgh, UK. p248. 27. Bouffard V, de Passillé A M*, Rushen J, Vasseur E, Nash C, Haley D B, and Pellerin D. 2017. Impact of following recommendations for tie stall configuration on neck and leg lesions, lameness, cleanliness and lying time in dairy cows. 7th International Conference on the Assessment of Animal Welfare at Farm and Group Level hosted by Wageningen University and Research, September 5-8, 2017, Ede, The Netherlands. 28. Villettaz Robichaud M, Rushen J*, de Passillé A M, Vasseur E, Haley D, and Pellerin D. 2017. Is compliance with animal welfare standards associated with improved profitability on Canadian tie-stall dairy farms? 7th International Conference on the Assessment of Animal Welfare at Farm and Group Level hosted by Wageningen University and Research, September 5-8, 2017, Ede, The Netherlands. 29. Villettaz Robichaud M, Rushen J, de Passillé A M, Vasseur E*, Haley D, Orsel K, and Pellerin D. 2017. Association between animal welfare standards and farm profitability on Canadian freestall dairies. 7th International Conference on the Assessment of Animal Welfare at Farm and Group Level hosted by Wageningen University and Research, September 5-8, 2017, Ede, The Netherlands. 32. Armstrong A*, Roche S, Vasseur E, Godkin A, Kelton D, and Haley D. 2016. A focus farms approach to motivating dairy farmers to improve animal welfare. Annual Animal Welfare Research Symposium of CCSAW. Guelph, Canada May 11, 2016. p7. 33. Westin R, de Passillé A M*, DeVries T J, Pajor E A, Pellerin D, Siegford J M, Vasseur E, and Rushen J. 2016. Automated measures of lying behaviour of dairy cows detect welfare problems on farms with automated milking systems. 50th Congress of the International Society for Applied Ethology July 12-15, 2016, Edinburgh, UK. p391. 2. Vasseur E*. 2017. Une analyse de lait pour prédire le bien-être et la santé des vaches? Invited presentation at AGA Novalait. Nov 6, 2017. Brossard, QC. 3. Vasseur E* & Bergeron R*. 2016. Effet de l'exercice et du confort à la stalle sur la condition des vaches en stabulation entravée. Étude sur les litières alternatives. Invited presentation at Colloque lait biologique 2016. Feb 10, 2016. Saint-Agapit, QC. 5. Vasseur was Chair of the session ‘Coup de chapeau 2017’ at the annual meeting of Québec Gv’t Stratégie québécoise de santé et de bien-être des animaux 2017, October 19, 2017. Québec city, QC. 6. St John J*, Rushen J, Adam S and Vasseur E. 2017. Que lest l’impact du positionnement de barre d’attache suivant la pente naturelle du cou sur le bien-êre des vaches laitièeres en stabulation entravée? Symposium sur les bovins laitiers du CRAAQ 2017. Drummondville, Canada Oct 24, 2017. 7. Villettaz Robichaud M*, Rushen J, de Passillé A M, Vasseur E, Haley D, and Pellerin D. 2017. Optimiser le bien-être des vaches pour améliorer la productivité et la rentabilité. Symposium sur les bovins laitiers du CRAAQ 2017. Drummondville, Canada Oct 24, 2017. 8. Ferland J*, Vasseur E, Duplessis M, Pajor E A, and Pellerin D. 2016. Impacts socio-économiques de la transition vers un système de traite automatisée dans les fermes canadiennes. (Transl. Economic impact of introducing automatic milking system on Canadian dairy farms.) Symposium sur les bovins laitiers du CRAAQ 2016. Drummondville, Canada Oct 27, 2016. 9. Palacio S, Adam S, Bergeron R, Pellerin D, de Passillé A M, Rushen J, Haley D B, DeVries T J, and Vasseur E*. 2016. Comment le bien-être des vaches laitières en stabulation entravée peut-il être amélioré par des modifications simples apportées à la configuration des stalles et l’accès régulier à l’exercice? (Transl. How much can different aspects of dairy cow welfare be improved by providing yearlong exercise to dairy cows kept in tie-stalls?) Symposium sur les bovins laitiers du CRAAQ 2016. Drummondville, Canada Oct 27, 2016. 1. Vasseur and team* organized a large public event within the 85th annual scientific conference of Acfas (Association francophone pour le savoir) hosted by McGill, downtown campus, May 8-12, 2017. The large public event named: De l’étable à la table (Transl. From barn to fork) was the only event of Acfas 2017 hosted on Macdonald Campus, and was hosted at McGill’s Macdonald Campus Farm on May 8, 2017. 2. Vasseur and team* participated and presented IRC’s research to 2017 edition of annual open barn event organized by UPA (Union des producteurs agricoles) hosted at McGill’s Macdonald Campus Farm on September 11, 2016. 3. Vasseur and team* participated and presented IRC’s research activities at INPACQ 2016 hosted at Y. Lampron & Fils Inc. dairy farm, Mauricie, QC on July 22, 2016. 4. Vasseur and team* hosted and presented IRC’s research activities to Holstein Quebec group at McGill’s Macdonald Campus Farm on July 19, 2017. 5. Vasseur and team* participated and presented IRC’s research activities to Holstein Quebec Provincial Convention 2017 hosted at McGill’s Macdonald Campus Farm in February, 2017. 20. Journal article. Portrait chairholder Elsa Vasseur & barn manager McGill’s Macdonald Campus Farm Chantal Charette. Interview by journalist Mario Séguin. Progressive Dairyman – en français. March 2017. p19-23. 21. Journal article by journalist Pauline Gravel, La Presse. Jane Goodall met l’élevage animal intensif au pilori. Interview of Vasseur at Young Women's Veterinarian Association (YWVA) World Annual Meeting published October 7, 2016. 22. Web article by Radio Canada-CBC. L’intelligence artificielle jusque dans les étables. Interview of Vasseur as a follow-up of participation to radio show by journalist Mathieu Dugal as part of Radio Canada-CBC technology-oriented program La Sphere. Les Drones et la vaches connectées. Published online June 21, 2017. 23. Web article by La Terre de Chez Nous. Une ombrière mobile pour améliorer le confort au pâturage, based on Palacio and Vasseur extension papier in Le producteur de lait québécois. Published online on May 11, 2017. 24. Web article by Marie-Josée Parent, le Bulletin des agriculteurs. Mieux comprendre la transition vers le robot. Interview of undergraduate Ferland at Symposium des bovins laitiers 2016 published online January 3, 2017. 25. Web article by Marie-Josée Parent, le Bulletin des agriculteurs. L’exercice et la modification des stalles sont bénéfiques pour les vaches. Interview of graduate student Boyer (who was presenting PhD Palacio’s work at Symposium des bovins laitiers 2016) published online December 27, 2016. 26. Web article by Bélisle Solution R&D Shyam Baurhoo in La Vie Agricole. L’université McGill accueille une nouvelle Chaire de recherche industrielle sur la vie durable des bovins laitiers, published online May 31, 2016. 27. Webarticle by Marie-Josée Parent, le Bulletin des agriculteurs. 1,8 M$ pour le confort des bovins, published online May 13, 2016. 28. Webarticle by McGill reporter Kathryn Jezer-Morton, McGill Reporter. Portrait chairholder Elsa Vasseur. When the cows come home, how long will they stay? published online May 2, 2016.